How does Schrödinger’s Clock® work? Most clocks aim to record the passing of time sufficiently accurately for the Observer to know what moment represents Now. This makes the design much easier as each second is marked out in the same way as any other. When the Observer looks at a clock, the assumption is that it is telling the right time. Schrödinger’s Clock®, on the other hand, will display either the right time (Now) or some other time when it is not observed. If it detects that it is Observed, then it will (usefully) revert to showing the correct time (Now). One other refinement is that Now can vary depending on location. If the time is noon in the UK, it is also 7am in New York, and 8pm in Tokyo. In other words, for different Observers of Now, they will record different times because of their location. Schrödinger’s Clock® can also be set to illustrate this difference in ‘Now’. Schrödinger’s Cat had a 50:50 chance of being alive or dead when the box was opened. In other words, the probability was the same as flipping a coin. Schrödinger’s Clock® goes beyond this and allows the owner to alter the probability of showing the right time. Common probabilities are pre-programmed into the Clock (e.g. 1 in 6 for the roll of a dice; or 1 in 37 for choosing the winning number at roulette), so the user can also learn about probabilities through using the Clock. Fans of Terry Pratchett’s Discworld books might recall the appearance of imps in the Disorganiser in ‘Jingo’. 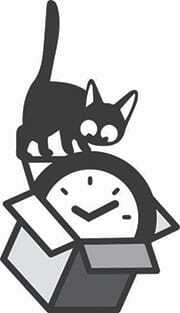 Tempting as it might be, no imps are employed in Schrödinger’s Clock®. Schrödinger’s Clock®, however, does not depart from the task of a timepiece in marking out time. Each second is marked out by a regular tick-tock, recorded from a 19th century regulator. This novel timepiece is patented, the trade mark protected, and the images copyrighted. This process was interesting as timepieces are normally assumed to tell the right time (Now), so the normal categories do not strictly apply for Schrödinger’s Clock®. A disclaimer was required to confirm that no claim is made to the exclusive right to use “CLOCK” apart from the trade mark Schrödinger’s Clock®!